If there is something I like a lot about the network today, it is the access to a huge amount of information that I did not even suspecte it can be possible a decade ago. In 2004, still spent hours in the reading room of the university librabry trying to find a particular magazine, where a certain building was published. Now most interior and design magazines that I read I find in the net and, although I still exude budget for magazine subscriptions (mostly Bulgarian magazines that can’t be found on the net – I want to know that’s going here), I read more and more online magazines. I was laso verry happy when I discovered the Issuu platform, where you can find almost anything. I also think it further stimulates the issuance of magazines. Creating an online edition still needs a little less resources than a paper version and in the last two or three years there are many good teams that displaced the individual projects (which seemed to me predominant in the beginning), and now offer great magazines that compete in quality with their paper counterparts and provide their own unique photo shoots, editorial projects and author’s articles. Online magazines do not take up space on the bookshelves at home and can be read not only on the computer screen but also on a phone or a tablet, and one can have access to new and old issues simultaneously without carrying heavy stacks. I was reviewing my Issuu library these days (the magazines there are organized in the form of stacks) and found that I follow quite a lot interesting interior and design magazines. Some of them I follow strictly and to be honest, not once I find inspiration for my blog posts or for some of my projects on their pages. That’s why I thought it would be interesting to share the most interesting of them. I hope you’ll enjoy the list and will find it useful. Furthermore, I will be glad if you help me to complete it and add other interesting titles to it! This is probably the magazine I follow most strictly and that’s why I’m starting with it. The issues have a primary topic (the last being The Nordic Issue), the interiors are extremely well curated – ther’s always something particularly interesting all around the world, but also feature a lot of Australian design, which is especially interesting to me, and the magazine’s internet site is very detailed and actually lives its own life independent from the edition. I highly recommend it! I’ve written before about this particular magazine and I am very pleased that it goes on so well. You can now order a printed version, and the internet site continues to evolve. The journal is published in Czech and in English, making it accessible to more people. The main focus is on design and lifestyle topics, but it also draws attention to the home interior and the homemade things and features delicious recipes. Moreover, it meets us with interesting people in each issue and pays much attention to quality photoshoots and the beauty in everyday life. I like it especially because of the specific central european style that differs significantly from all the other magazines I usually read. 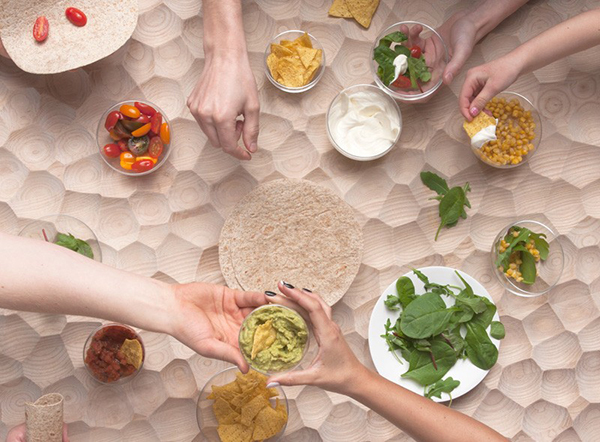 Nordic Living is published by the online store of Nordic Design Collective, in which you can find great products from nordic independent designers. The publication mainly promotes things that are sold in the shop of course, but it also highlights trends and complemented them with stories and interviews with these designers. If you prefer reading on a site, you can follow their blog, where you’ll find the same materials from the magazine and many others. I personally like a lot the mood boards with their products because they combine everything very well, not to mention that I probably want to buy at least half of the things published on the site :). This is probably the only online Scandinavian magazine I am reading at the moment. I do follow a lot of Scandinavian blogs and real estate sites and the Bolig Magasinet of course but it is basically a paper edition and it is in Danish, so Nordic Living is rather unique title in my reading list. This magazine focuses on British design and unlike other English publications that I follow, holds more modern and simplistic style and features ideas that can be applied everywhere. Winkelen is another great Australian magazine with love for beautiful products and great design. In general, I have to admit that lately I like more and more the Australian interior design. I follow Lonny for quite some time now. It recently underwent a major change in its design – from a classic online magazine with pages it has evolved in a more sophisticated online experience, although it kept the ​​separate issues with articles. This is currently one of the few American magazines that I follow. Before the change the issues were especially thick and filled with many articles and a lot of interiors. Currently the selection is smaller but better curated and arranged and it seems to me that they are focussing more on somewhat more elegant styles, although the American splendour is still present. 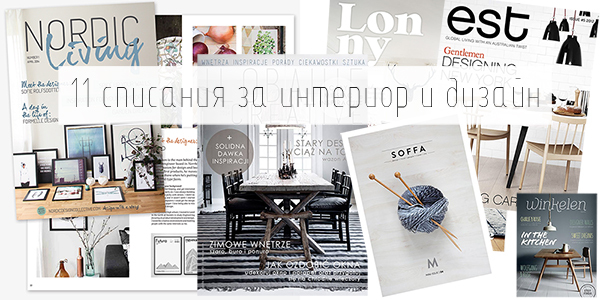 Antre is the only Bulgarian online magazine on interior and design at the moment. Initially I started to follow it with very mixed feelings, because they wrote about realy good interiors but had this poor graphic layout that spoiled the experience. However, last year they switched to publishing only on the main site and I must say that I find it a great idea – now I read Antre with great pleasure and I think I’m not the only one with that opinion. This magazine is published only in Bulgarian. Focused on interiors from Texas – traditional, splendid and very elegant. The issues are short and easy to read. The magazine is published flawlessly for five years now because it is focused on interesting people and shows their homes and their specific lifestyle. I discovered many artistic interiors scanning through the old issues. A brand new discovery for me – it says in Issuu it’s a UK edition, but i know it’s a Maltese magazine and I am very glad I finally found them I passed by their plate in Sliema last summer but then quickly forgot the name and I wasn’t able to find them on the internet because of that. I find the magazine interesting particularly because it features Maltese interiors with vaulted ceilings and bright limestone walls without plaster, so typical for this sunny Mediterranean island.